The Nikon D3S accommodates a wide range of Nikkor lenses, via the standard Nikon "F" lens mount. The D3S's lens mount includes both a mechanical AF coupling for older lenses, and AF electrical contacts for the latest AF-S or AF-I Nikkor lenses with internal focus motors. With very few exceptions, you can use the D3S with any F Mount Nikkor lens ever made. There are some exceptions however. See the table below (provided courtesy of Nikon USA) for details. Like all professional (D3X, D3, D2X, etc.) and most semi-pro Nikon SLRs (D700, D300S, D300, etc. ), the D3S's lens mount includes an AI aperture ring coupler, a little metal vane located just outside the lens mount flange (at about 1 o'clock), that interfaces with old AI Nikkor manual focus lenses. This engages with the aperture ring on AI-style Nikkor lenses, and lets the D3S support aperture-priority metering mode and provide manual-exposure metering with them. Non-CPU Lens Data: The camera being able to register data for up to 9 lens types. As mentioned above, non-CPU lenses can be used only in Aperture-priority or Manual exposure modes. The D3S can "register" up to nine non-CPU lenses. 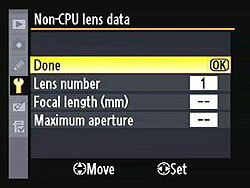 By specifying focal length and/or maximum aperture manually, access to a number of CPU lens functions is possible with a non-CPU lens. If the focal length is known, the camera can automatically power zoom SB-900, SB-800 and SB-600 flash units, and the focal length will be displayed (with an asterisk) in the playback info screen. If the maximum aperture is known, the aperture value is displayed in the top panel and viewfinder, flash level is adjusted for changes in aperture, and the aperture is listed (with an asterisk) in the playback info display. Specifying both focal length and maximum aperture enables Color Matrix metering, and improves the accuracy of center-weighted and spot metering, as well as i-TTL balanced fill-flash. The focal length field accepts values from 6 to 4,000mm, while the maximum aperture ranges from f/1.2 to f/22. In a digital SLR camera, the Optics heading would seem to have more to do with the attached lens than the camera itself. The camera body is responsible for autofocus, though, so it makes sense to talk about autofocus technology here on the "Optics" tab of this review. In the case of the Nikon D3S it turns out that the camera-side of the equation has a lot more to do with image quality than is generally the case. The Nikon D3S carries the same autofocus system over from the D3 and D3X with a few changes. The only obvious difference we could spot were two additional settings for Focus Tracking with Lock-on in Custom Menu a4. The is a programmable delay the camera uses to attempt to reacquire the subject when it is temporarily obscured by objects passing in front of it. The D3 offered three delay settings (Short, Normal and Long) plus Off, while the D3S adds two intermediate settings. Our testing did however show that the D3S was noticeably slower at recognizing accurate focus for a static subject in the normal phase-detection mode than was the D3. We have no explanation for this, but the results were confirmed in multiple tests. We'll try to ask Nikon about this, to see if they can shed any light on the differences in our measurements between the two cameras. Like the Nikon D3X, D3, D700, D300S and D300, the D3S's Multi-CAM 3500 AF system sports no fewer than 51 "precision focus" AF points spread across the frame. (More on that "precision" designation below.) A total of 15 AF points are cross-point type, sensitive to both horizontal and vertical detail. The Multi-CAM 3500 AF system offers 9-area, 21-area, 51-area, and 51-area with 3D tracking modes. There's also an option that lets you choose a single active point from a selection of 11, as an aid to users transitioning from older bodies, or those using both old and newer bodies simultaneously. The reference to "3D tracking" above alludes to the most unusual feature of the AF system, namely the use of the 1,005-pixel RGB exposure sensor to assist in tracking moving subjects. This is one of those innovations that make you wonder why someone didn't think of it earlier. It's evident that only Nikon was poised to make a move like this, as they're the only SLR maker using such a high resolution sensor in their evaluative AE system. As far as we know, they're also the only ones using an RGB sensor for evaluative metering, something with adds to its usefulness for object recognition. Tracking autofocus systems are surprisingly adept at interpreting the rather limited data from a handful of AF sensors, and using it to intelligently track moving objects. If you think about it, the amount of information the AF system has at its disposal is very limited: All it has to work with are approximate subject distances at a handful of AF points across the frame. By interpreting changes in the data coming from each, the AF system attempts to pick a subject from the background, then determine the subject's direction and speed. In fact, AF systems lack almost all the things that our own visual systems use to discriminate objects with: Color, tone, shape and subject size. It's really amazing that AF tracking works as well as it does. This is where Nikon's innovation in the Multi-CAM 3500 AF system comes in. Nikon has for a long time had a 1,005-pixel RGB sensor in their camera bodies, used by their excellent 3D Matrix Metering system. In matrix metering, patterns of tone and color are used as an index into a large database of "reference scenes" stored in the camera's memory. The camera doesn't directly understand it's snapping a portrait shot, but when it sees a human-shaped blob against a different color background, its scene indexing tells it that it should try to get the exposure of the blob correct, even if it means the overall scene brightness would come out low. With the D3, D700 and D300 series, the Nikon engineers have used the data from the 1,005 pixel RGB exposure sensor to help guide the camera's autofocus decisions. While the RGB sensor provides no distance information (D- and G-type lenses do), it has much more resolution than even the greatly expanded array of AF points on the new AF sensor. The AE system also incorporates a Diffractive Optical Element (DOE) designed to improve the effective resolution of the RGB sensor. The 1,005 element AE sensor also captures both tone and color information, which should make it easier to discern where objects are in the field of view and how they're moving. The net result should be more sure-footed and accurate tracking of subjects as they move about the frame. The relatively high resolution of the RGB sensor should let the camera determine the subject's location more precisely, and therefore develop more accurate measurements and predictions of its motion. In our discussions with Nikon staff, it also appears that the RGB sensor is contributing some tracking information even when the subject has moved outside the area covered by the AF sensors. At first this didn't seem to make sense. What good would it do to know where the subject is if there aren't any AF sensors there to tell the camera how far away it is, or how fast it's going? It turns out that there are a number of ways the AE sensor could help the AF system outside the active AF area; in my discussions with Nikon engineers, though, I learned that the primary purpose for out-of-area tracking is to reduce the time required by the AF system to re-acquire the subject. As the diagram above shows, the 1,005 element RGB sensor covers a somewhat greater portion of the frame than do the 51 active AF points. (When I asked the engineers just what portion of the frame area the RGB AE sensor covered, however, they politely but firmly declined to say.) The wandering red line drawn on the figure shows the path followed by a hypothetical subject during a continuous burst of exposures. Note that a portion of the subject's path (the part between the two blue "X" marks) is outside the active AF area, yet still within the area covered by the 1,005 pixel sensor. In previous Nikon AF systems, and those of competing manufacturers, the AF system would have no idea where the subject was once it passed beyond the active AF area. As a result, it would take more time to re-acquire the subject when it re-entered the active AF area near the bottom of the frame. In the Nikon D3, D300 and D700 series though, the AF system will remain aware of the position of the subject, even if it doesn't know its range while it's outside the AF area. When it re-enters the AF area, the camera can quickly determine its range, and doesn't need to spend any processing cycles figuring out which AF point is covering it. It's easy to imagine how this capability could help in the tracking of difficult subjects: While I'm sure it's less of a problem for pro shooters, I myself have often encountered situations in sports or wildlife shooting where it was a challenge to keep a rapidly- or erratically-moving subject framed within the AF area. If the camera were able to track such subjects when they wandered slightly outside the AF area, I'd expect I'd have had more "keepers" when I came back from the shooting sessions. This edge-of-frame tracking ability isn't a panacea though. While the engineers declined to say just how much of the frame the RGB sensor covered (and I did press them on this point), it seems that it doesn't extend too far beyond the edges of the AF array. In our discussions, they were clear that the system could only track objects a small distance outside the AF area. They seemed much more emphatic about the impact of improved tracking accuracy within the active AF area than outside it. Still, the ability to reduce re-acquisition time, even in a limited percentage of cases, is a very worthwhile feature. In the case of the D300 series, the Matrix metering sensor is likely to cover almost the entire frame, so the D300/D300S have a slight advantage. One question of course, is why Nikon waited so long to develop such an AF system. After all, the 1,005 element RGB sensor has been in use in Nikon SLRs for over 10 years now. When I asked the engineers about this, they said that a key factor was the speed of the CPU used for camera management, the chip that handles autofocus, autoexposure, and user interface operation, as opposed to image processing. The control processor used in recent Nikon SLRs is considerably faster than similar processors in earlier models, and now has sufficient throughput to do meaningful image processing with the 1,005 element sensor data in real-time, where earlier units did not. Secondarily, the newly-added Diffractive Optical Element brings greater imaging precision to the 1,005-element sensor, permitting more accurate discrimination and localization of objects within the AE area. These days, most improvements in camera functionality are incremental, basically taking what had been done before, only now doing it a bit faster, a little more precisely, etc. In contrast, Nikon's use of RGB exposure sensor data to assist AF operation stands out as a more radical innovation, bringing an entirely new approach to the problem of AF tracking, different from any we've seen before. It's a very clever idea. Nikon D3S AF "Fine Tuning"
The microscopic pixel dimensions of modern digital sensors have placed more extreme demands on autofocus accuracy than was ever the case in the film era. This has revealed a lot of shortcomings in autofocus systems, not the least of which have been the frequent "near-miss" mismatches between particular lens/camera combinations. A lens that focuses fine on one body may front-focus on another and back-focus on a third. Change bodies and the problem may move to another lens. 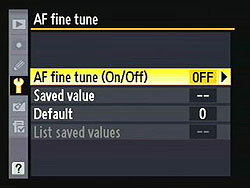 AF Fine Tuning: You can make micro-focus adjustments for up to 20 lenses, or adjust the body (default). Ideally, there'd be a way to tell the camera to tweak its focus forward or back just a tad, depending on the lens you were using. In fact, this is just what the Nikon D3S provides: You can register up to 20 different lens "types" with the camera (more on "types" in a moment), and make micro-adjustments to the AF system for each. This is an area where Nikon has followed Canon's lead. The Canon EOS-1D Mark III first introduced the idea of AF micro-adjustment when it was introduced back in late February 2007. Both can keep track of 20 different "registered" lenses. What does lens "type" mean here? Basically, a lens "type" is a lens model. For instance, if you have a 70-200mm f/2.8 and a 100mm f/2.8 Micro, the camera would recognize each lens when it was attached to the camera, and automatically load the appropriate fine-tuning setting. If you had two 70-200mm f/2.8s though, the camera would have no way to distinguish between them, and would load the same fine-tuning settings for either one. While there may be some photographers (particularly pros) who have more than 20 lenses in their kits, the 20-lens "fine-tuning library" will cover the needs of the vast majority of shooters. It also appears that the Nikon D3S's fine-tuning system can recognize lens types, regardless of who manufactured them. This is a huge step forward in focus accuracy, giving photographers the tools they need to maintain and calibrate their own equipment. Of course, the Nikon D3S also supports manual focus, and with the big bright viewfinder, it's fairly easy to do despite the lack of split-image or microprism focusing aids found in manual focus film SLRs. An "electronic rangefinder" display consisting of a center dot and arrows on either side at the bottom left of the viewfinder information readout shows current focus status even in manual focus mode. When focus is achieved, the center dot illuminates. When the subject is not in focus, the arrows indicate which direction focus must be adjusted. The rangefinder works with any lens with a maximum aperture of f/5.6 or faster. One nice feature is that you can select which of the 51 focus points to confirm manual focus with. The electronic rangefinder is also active during autofocus operation, as visual confirmation of focus. One of the most significant changes in the Nikon D3S outside the imaging pipeline and video support is the inclusion of Nikon's Dust Reduction system -- the first time the company has offered the technology in a full-frame camera with 100% viewfinder coverage. The system functions by vibrating the optical low-pass filter over the CMOS sensor at four distinct frequencies to shake free any dust particles that are adhering to the filter. This process can be initiated at the user's command, or automatically either when the camera is first switched on, or right before it powers off, or both. Nikon's "Image Dust Off" software solution is also provided, where a dust reference photo can be taken and then utilized in Capture NX2 (optional) to remove dust in image post-processing. That said, we've found in-camera dust-removal systems less than perfectly effective. You're still going to need to use a sensor-cleaning kit fairly often, so the advantage of in-body dust removal is perhaps less than it might seem. If you've got dust specks on your sensor (and sooner or later you will), you're going to need to clean it. There are a lot of products out there intended to address this need, but a distressing number of them work poorly (if at all), and many are grossly overpriced. Advertising hype is rampant, with bogus pseudo-scientific jargon and absurd product claims. And prices -- Did I mention prices? How about $100 for a simple synthetic-bristle brush? We don't pretend to have used everything currently on the market, but we can tell you about one solution that worked very well for us. The "Copper Hill" cleaning method is straightforward and safe, and in our routine usage here at Imaging Resource, highly effective. Better yet, the products sold by Copper Hill Imaging are very reasonably priced. Best of all, Nicholas R (proprietor of Copper Hill) has put together an amazingly detailed tutorial on sensor cleaning, free for all. No "kit" lens, but the D3S's automatic chromatic aberration correction and vignette control in its JPEG files are effective, improves any lens you use with the camera. As we found on the D3, the Nikon D3S's in-camera correction for chromatic aberration worked very well, as seen in the crops above. The image on the left is from a RAW file, converted through Adobe Camera Raw, with no lens correction applied, and just enough sharpening to approximate the look of the D3S's JPEGs, shot with the default sharpness setting. The crop is taken from the upper right hand corner of an image captured with the Nikon 24-120mm f/3.5-5.6D lens. It's an older lens, so it doesn't perform as well as most modern lenses in its class when it comes to C.A. Like all recent Nikon full-frame DSLRs, the D3S offers what the company calls "Vignette Control", which reduces corner shading caused by the lens. There are four settings available in the Shooting menu: Off (default), Low, Normal and High. The above shots were taken with a Nikkor 24-140mm f/3.5-5.6D lens at 24mm wide open. As you can see, even the High setting doesn't eliminate all the corner shading, but it's still much better than with it Off. Nikon says Vignette Control works for G- and D-type lenses, but DX and PC lenses are not supported. We're not sure if it'll work with third-party full-frame lenses. Like CA correction, the shading correction is applied only to JPEGs or TIFFs. Vignette Control does not apply to multiple exposures, DX format images or images created with Image Overlay, nor does it apply to movies. Its effect cannot be previewed in Live View mode. We use a Sigma 70mm f/2.8 Macro lens in our laboratory testing, as our tests on SLRgear.com have revealed it to be one of the sharpest lenses we've tested. The images above were taken from our standardized test shots. 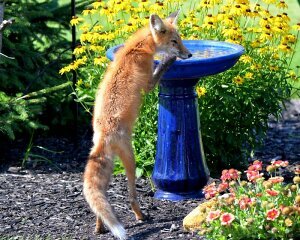 For a collection of more pictorial photos, see our Nikon D3S Photo Gallery .